I recently finished reading the novella Sin of Damnation, also known as Space Hulk: the novel, so thought I’d turn this week into some kind of Warhammer 40k nostalgia week and talk about it here for a bit! The novella runs to just under 100 pages, and reads a lot like a disaster movie. It’s basically a novelisation of the events of the classic board game, and takes us though the Blood Angels first company boarding the space hulk Sin of Damnation. I thought it was quite funny how it felt a little like a RPG storyline, with the terminators fulfilling objectives aboard the space hulk at the direction of the off-screen Captain Raphael, who seemed to be some kind of weird GM. Of course, there is a lot of space marine vs genestealer action in the book, with some really nicely written parts from the point-of-view of the Broodlord. While the story lacks the scope of something like Shield of Baal: Deathstorm, there is nevertheless the sense that this is the antecedent of the Shield of Baal storyline. As the story went on, I thought it was interesting to note that there were multiple Broodlords within the hulk, something I guess I hadn’t thought about previously. Just assumed that there’d be one overall leader that directed the hive mind. But there we go! The book also includes a second short story that was published in the 2014 edition, Sanguis Irae, which follows the librarian Calistarius on another hulk, as he delves into the mind of a long-comatose Blood Angel who has managed to preserve his life despite being in the grip of the Black Rage, enough to allow his battle brothers to defeat a Navigator-Broodlord aboard the vessel. That was weird, I have to say, and I found myself trying to work out how such a creature would come to be – presumably a member of the Navis Nobilite was infected by a genestealer, so the child was both purestrain and a navigator? Who knows. The story was quite intriguing in the way it blended the recollections of the Black Rage guy, along with the fact that the Black Rage basically makes a Blood Angel believe he is Sanguinius in his final moments aboard the Vengeful Spirit. The three timelines of the story worked quite well, at any rate, and it wasn’t as confusing as perhaps it could have been! Anyway, all this talk of genestealers has me wanting to share with you all some progress with my own brood! As you know, I’ve been struggling for years now to get my Genestealer Cult models painted – I love the army, and love the models, but find it extremely difficult to actually make any headway with the force, due to the models being so insanely detailed. I recently managed to finish 11 Neophyte Hybrids, which I think has helped a great deal to see how I can get the colour scheme painted in bulk, and have therefore been ploughing ahead with some Acolyte Hybrids this time around – as well as the first of my Purestrains! The minis are definitely coming along nicely, I think! I’m a little concerned that they look a bit too blue in comparison with the Neophytes, but they are more hunched, so it is slightly more difficult to make out the points of similarity between the two troops choices. But they’re painted with the same fatigues, armour and such – it’s just that the Acolytes have more carapace on show! I’m quite pleased that I’ve managed to get these painted in a little less than a month, however – especially considering there has been a lot of Necron activity going on in the month, also! 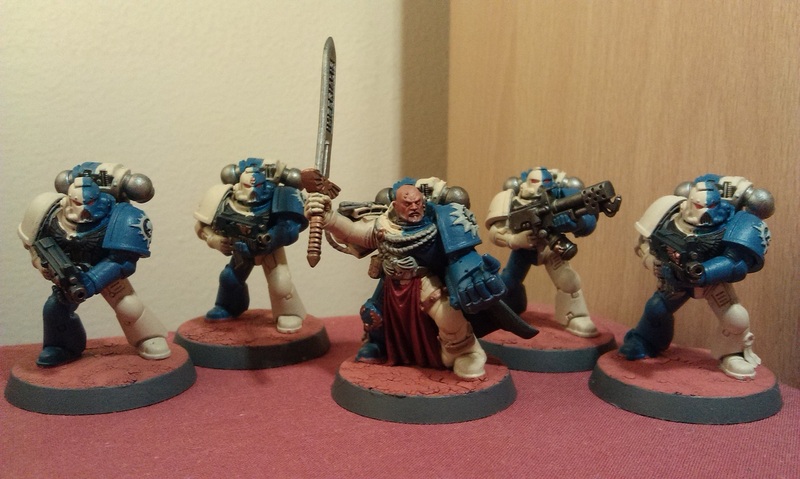 I’m pretty much committed to playing the Cult in Kill Team for now, anyway, so I’ve got a few more models I want to paint up for that, then I’ll have my main force finished. My local GW has a campaign starting on the 15th, though I’m currently away on honeymoon so won’t be able to join in with that quite yet! Once I have my Cult sorted though, I’ll be able to focus once more on getting the Necrons reanimated in the Thokt Dynasty colour scheme, and that will likely take me up to the end of the year! Splendid! Well it’s been a very exciting weekend for me, as I’ve been painting a whole load of miniatures with something close to abandon! I’ve not painted so much for a long time, and it feels great! First of all, at the back end of last week I had hoped to get a game of 40k in at the local store, with a guy who I know has about 2k points of Deathwatch. So I’d been looking at my Dark Eldar army, which I know is well over 2k, and trying to organise myself into the usual double-battalion of Kabal and Coven. In turn, that got me looking at the box of Dark Eldar that I’ve had primed/partially painted, and pulled out a few bits to start working on. One of which, as it happens, is the glorious Razorwing Jetfighter! I think this has been built for well over a year now, and has just been gathering dust while primed with Rhinox Hide and ready. Over the course of the weekend, I’ve managed to get the brown armour highlighted, and just need to paint the metallics on the wings to give it that razor-edged look. I’m really pleased to have it in the army, anyway, and I’m already looking forward to when I can get in a game and see how well it does! I’ve also been working on some Court of the Archon minis – the Ur-ghul and the Medusae, both finecast minis that I’d put together a while back but hadn’t really done a great deal with. I already have a Lhamaean, and have used her a couple of times (though never managed to do anything with her, I think I’m a bit scared about getting my HQs too close into combat, though my Archon has once used a Huskblade to destroy an Ork Boss. Anyway!) I like the idea of having a Court in a Venom and just throwing it at the enemy, and seeing how well they do… Last up, then, I’ll need to get that Sslyth sorted! I’ve not painted any Drukhari for what feels like an age – I last finished some models for the army in February – though I have got a second Ravager almost finished. I think it was probably the fact I only have one crew member left for the Ravager that prompted me to get some of these models out and start painting them again, actually. I’ve only ever painted three Reaver jetbikes for the army, but have an absolute ton of them built from last winter, when I wanted to get moving with a Wych Cult force. I’ve used the bikes once or twice in games, and I seem to remember they did really well, so it makes sense to try some more! However, in keeping with the lore, I like the idea of having mine as small tripartite gangs of bikers joining the raiding party for a lark, and so wanted the chassis to be different colours to denote this. Having tried to get red last time, this time I thought I’d go for yellow, as it’s a colour I tend not to bother with (aside from the warheads on my smart missile systems!) So far, I think they’ve turned out really well, anyway! It’s a bit of an odd one, given I’ve been painting so much Dark Eldar, but I suppose the return of my Dark Eldar has got me thinking about even older armies, and the Necrons are a force that takes me right back to the very start of my 40k life. I built this Night Scythe in 2015, and managed to get some of it painted in that time, but I think it was possibly the biggest model I’d painted up to that point (it was certainly the one with the most flat areas), and I was a little nervy about getting it to look good. I was also hopeless at working out a scheme for my Necron vehicles that wasn’t just basically Caliban Green, so it was consigned to oblivion all these years. All of this stuff seems to date from 2015, which is quite shocking really. I know one of the things that always keeps me going with Necrons is the idea of the implacable tide of infantry, I thought I’d done more of the war machines than this! It’s definitely time to change that, though I’m still really finding it difficult to come up with a Codex list that I actually like the look of, so I’m not yet sure how I want to play my Newcrons in 8th edition. I came up with the above back in March when the Codex was fresh, but that is a hell of a lot of infantry, with just the Command Barge as a big thing. 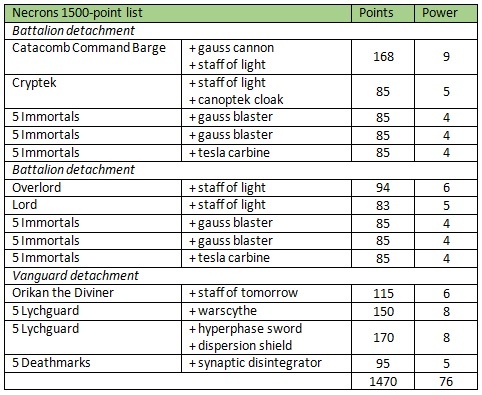 It’s definitely time to do more with the Necrons than just Immortals and Lychguard, but the cost of these units is kinda prohibitive, and seems to lend itself much better to large-point games. Having the flyer will, I think, be a huge thing for my force, as it acts as a transport as well, though obviously I wouldn’t want to go filling it to capacity as the way the rules work for the Night Scythe mean that any models that haven’t entered play when the Scythe is destroyed are also destroyed. But I think it could be a very useful delivery system for Lychguard while the Immortals hang back as a bit of a gun-line. Anyway, I’m rambling a bit here! So I need to get my act together and write up a Necrons list that I actually like the look of; I’ve got a Drukhari list that I do like the look of, so just need to finish off the couple of models that aren’t yet fully painted so that I can actually field it, and then I should be good to go! Honestly, I’ve never been as excited for the hobby as I am right now!! 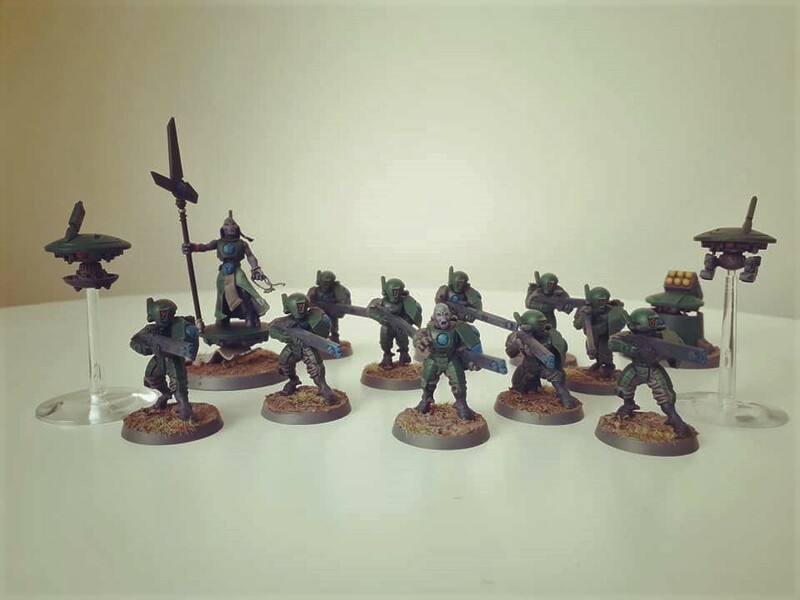 Author spalanzPosted on August 20, 2018 August 25, 2018 Categories painting, WarhammerTags Dark Eldar, Drukhari, Necrons, painting progress, Warhammer 40kLeave a comment on Painting Weekend! Just thought I’d share with you all some Summer Painting Updates, after having a fairly productive weekend with the minis! Unfortunately, I’ve yet to lift a brush to my Militarum Tempestus force, and the Skitarii have only vaguely been looked at, so this update will be purely based on the T’au part of my painting goals. After exactly four months, I have finally managed to finish painting my first Fire Warrior squad! It feels like it shouldn’t have taken this long, but I guess it was a long slog trying to figure out the scheme, and then trying to work it so that I could paint things quicker than usual. I’d say that, once I got going with it, it wasn’t too long to get everybody done. The drones are fairly quick to do also, I’m not trying to go in for a stunning standard with anything here, but very much trying to get them ready for the tabletop. So no glowing lens-effects, or anything! Though I have tried to get some vague glow-like effects on the ends of the plasma weapons. Anyway, let’s talk about the scheme! The armour is basecoated with Caliban Green, then drybrushed with Kabalite Green, Warpstone Glow, and a final highlight of Niblet Green. The fatigues are basecoated with Mechanicus Standard Grey, then shaded with Nuln Oil. I had been toying with drybrushing them with Dawnstone, but have decided against that. 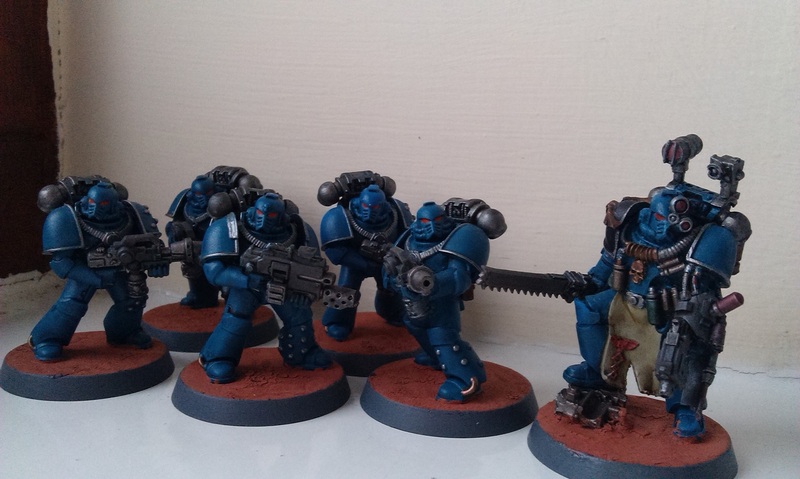 The weapons are basecoated with Dark Reaper, then shaded with Drakenhof Nightshade, before a light drybrush of Thunderhawk Blue – not too much, just enough to help bring out the details. The blue badges are all painted with Caledor Sky, shaded with Drakenhof Nightshade, and a light drybrush of Teclis Blue just to help brighten the details back up. I also then drybrush the ends of the plasma weapons with Teclis Blue, to give the effect of an active weapon. The bases are then done with Armageddon Dust, with some Agrellan Earth dabbed on here and there. Once all that is dry, I shade the whole lot with Agrax Earthshade, then when that is dry, drybrush it with Terminatus Stone. I’ve still got some of the Burnt Grass basing flock from back in the day, so I then add a bit of that with PVA glue – Tau armour is meant to be camouflaged against the environment they’re in, so if I were painting a desertscape for the base, it should by rights be a more tan/ochre colour. Adding the grass helps to justify the green of the armour, but the red bits in the flock do help to add interest to the base overall. So there’s my T’au army to date! 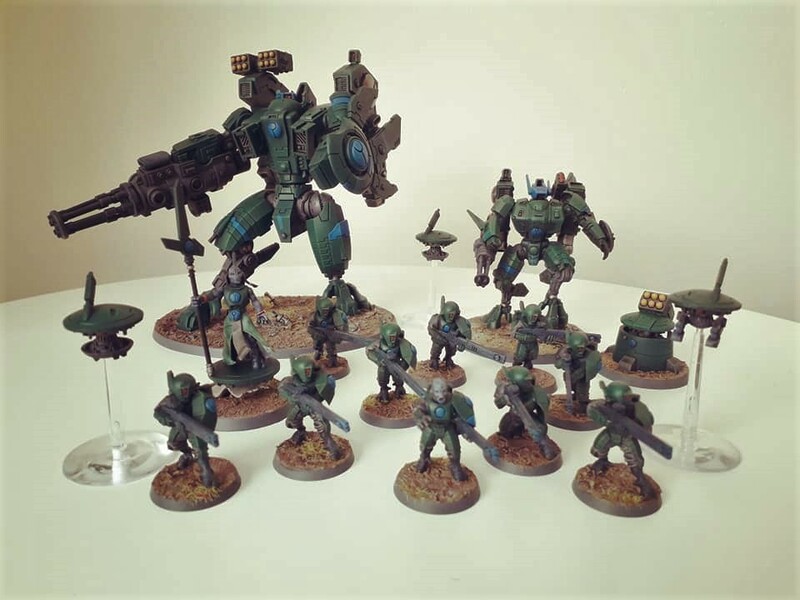 I do need more drone support, and I do need to get moving with more troops as well, but I’ve actually started basecoating every battlesuit that is on my painting table with Caliban Green at the minute, so I should probably get a grip and stick to the plan! I’ve previously made a fairly decent start on some Pathfinders, so I think next on the list will be trying to get a squad of those finished, along with their accompanying drones. Author spalanzPosted on July 11, 2018 July 11, 2018 Categories WarhammerTags painting progress, Tau, Tau Empire, Warhammer 40k2 Comments on Summer Painting Updates! Hobby Progress is back! That’s right – after last year’s weekly update blogs, I’ve decided to go for a monthly update throughout 2017, as I had been feeling a bit pressured at times to get something done, and a lot of things were rushed as a result. I still think I managed to turn out some pretty nice miniatures, compared with my previous standards, but I really want to level up my painting and try to really improve my skills this year, so I thought I’d go for the monthly check-ins rather than the more relentless stuff. That all said, January has been a tough month for getting anywhere with painting models! I’ve had several different kits on the tabletop that I’ve really struggled to get very far with, and I do believe it has something to do with the lack of any real incentive to get them progressed. But for now, I want to stick to the monthly thing. Without any further ado, though, let’s take a look at what I’ve been up to! First of all, I’ve well and truly started on my Dark Eldar. I bought the Start Collecting box and a Venom on New Year’s Eve, and after giving the Codex a once-over, added a box of Wyches to the roster in order to start out by making a kill-team. Over the course of the long New Year weekend, I actually built everything up, but have been struggling to get the models painted ever since! To start with, I chose the Kabal of the Obsidian Rose for my colour scheme, a wonderful rich brown colour. Brown is something that I’ve had no recourse to paint before, of course, so I thought it’d be a nice way to increase the breadth of my painting. The scheme I’ve used has a basecoat of Rhinox Hide, followed by a very light drybrush of Doombull Brown. I then lightly drybrush Skrag Brown and Squig Orange, increasingly focused onto the raised details of the armour, before a very thin wash of Agrax Earthshade across the whole lot. You can see in the above photo that it has worked better on some than others, but I think that’s more due to the fact I’ve been testing it with my actual miniatures – never a bright idea, I know! The splinter rifles, where they’ve been painted, have just got Leadbelcher shaded with Nuln Oil, with those weird bulbous bits painted Balthasar Gold. It’s very straightforward, which I want it to be for the line troops, but I think it has come out really well, by and large! For the Wych Cult, I’ve gone for something that is different, yet still tied into the general scheme of things. Where they have kabalite armour, such as the left knee and arm, I’ve done the same scheme as the warriors. The wychsuit, however, is just Khorne Red shaded with Agrax Earthshade, then lighly drybrushed with Wazdakka Red. For the longest time, I was trying to figure out what to do with the skin, as I wanted to try for that pale skin tone, but when I tried it, it just didn’t work out for me. I used Celestra Grey, washed with Druchii Violet, and then layered with Pallid Wych Flesh on the Wyches (urgh!) and Ulthuan Grey on the warriors (yikes!) It just wasn’t happening for me, and I couldn’t work out a way forward. Then, I was pointed in the direction of The War Gamer on youtube, specifically his Captain Artemis tutorial, and that put me in mind of painting the skin with the wash last. After talking about it at my local GW on Friday, I went back in with Kislev Flesh and Reikland Fleshshade, and it really came out looking nice, I think! I’ve subsequently painted the rest of the Wyches that I had hanging about with Celestra Grey/Kislev Flesh/Reikland Fleshshade, and I think they look okay. I do think part of my reticence comes from the fact that the hair is still making the models look a bit weird, so that’s my next port of call, and hopefully I’ll feel a lot better about them once that has been done. Moving away from xenos now, the “Strokes of Heresy” painting competition continues at my local Games Workshop store, with the January challenge being an elite choice. Many people have gone for cataphractii terminators or contemptor dreadnoughts, but I honestly didn’t think I’d be able to get anything major done, what with the Dark Eldar going on, so had bought the apothecary there specifically for the event. Even that one model has taken it out of me this month, though! I’ve eventually managed to get him finished with my usual Alpha Legion scheme, painting all of those vials and canisters all over him with a variety of washes. We’re in pre-Codex Astartes times, of course, so there’s no actual requirement for a white scheme – hence the black shoulder pad, I suppose! The narthecium has been painted with Stormvermin Fur and shaded with Nuln Oil, as per the usual scheme for bolter cases, to help tie him in with the rest of the army. I don’t yet know what the challenge is going to be for February, but I’m hoping that I can get the five terminators I’ve had built for over a year painted, if nothing else!! I’ve also added the Chapter Master to the ranks. He was a miniature that I’ve really enjoyed kitbashing together – the legs are from the Sternguard kit, as is the power fist and backpack; the body is from the Commander kit that I had as part of the Demi Company box set I’ve had hanging about for a while now; the sword is from the Vanguard Veterans, and I’m honestly not sure where the head is from! Possibly the Sternguard kit as well. That kit is actually a treasure-trove for kit-bashing fancy marines like this, I have to say! 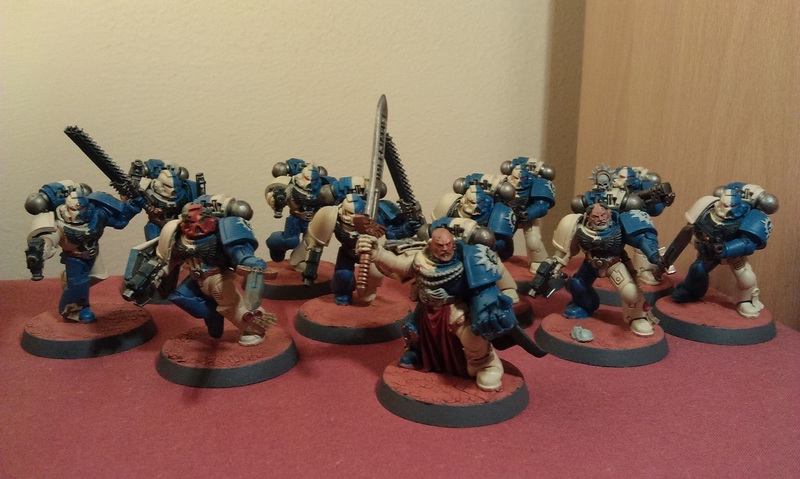 While I’m pleased to have them now finished, I do feel unfortunately that the Chapter Master is a little beyond the realms of my skills to complete to a properly high standard. I’d have liked him to look a little better, but I think for now, he’s as good as I can absolutely get him! I do still have a dreadnought that is in the throes of almost being completed, and I’m in the process of rescuing the marines from my initial attempt at painting Novamarines from last April, so I’ll hopefully be able to add them to the force soon enough (though unfortunately, they won’t have the fancy shoulder pads). I want to try to get these guys built up into a fighting force soon enough, but obviously it’s not the sort of scheme that lends itself to fast painting! So that’s been my progress this month! Check back in with me next month to see how far I get with the Dark Eldar, and whether I manage to complete any other miniatures… I’m aiming to paint one unit per month, so we’ll see how well I can manage that! Author spalanzPosted on January 30, 2017 January 29, 2017 Categories paintingTags Alpha Legion, Dark Eldar, Games Workshop, Kabalite Warriors, Novamarines, painting progress, Space Marines, Warhammer 40k6 Comments on Hobby Progress 2017!